The Sonar Low Pressure Y-Block provides the ability to easily split a single low pressure supply line to service two devices such as BC, drysuit, and second stage regulator. Comes standard configured with two 3/8"-24 UNF Female outlet ports and a 9/16"-18 UNF Male inlet port. 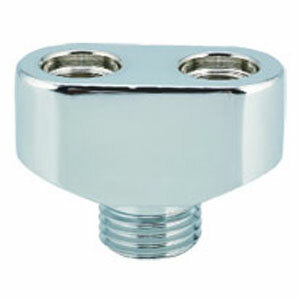 The male 9/16" inlet can connect to the 2nd stage regulator end of a standard LP regulator hose. The two female 3/8" outlets can accept the first stage regulator end of a standard regulator hose. Made of durable marine grade chrome plated brass material.